Papertrey Ink is now on Pinterest! Like some of you, I am a huge fan of Pinterest and it's my go-to place for inspiration. I love Pinterest not only for its unlimited inspiration but also for its convenience. Ideas and color combos are booked marked in a visible and organized format and are easily accessed via my computer or smart phone. So inspiration is available almost everywhere I go. Papertrey Ink has joined in on the Pinterest craze (you can find them here), and now it's as easy as ever to find your favorite Papertrey Ink projects and inspiration. If you're not familiar with Pinterest be sure to check it out, but I warn you... it's a bit addicting! Stop by Nichole's blog for more info. So, for today, our focus is on finding and sharing a single inspiration piece (via Pinterest) that has inspired our cards for the day. 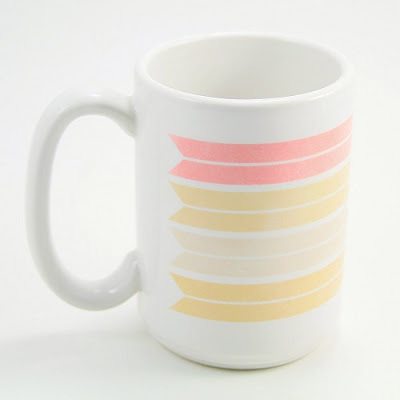 Here's what I found... Instantly, I fell in love with the colors on this mug! The white base with the pop of color is so me, but for today's project I've chosen to be inspired by the design. My inspiration piece can be found here. In my mind, I translated the design on the mug as a number of die cut banner strips cut down the center. To create, I began by die cutting Double Ended Banners from pattern paper (Basic Grey Sweet Threads Collection). 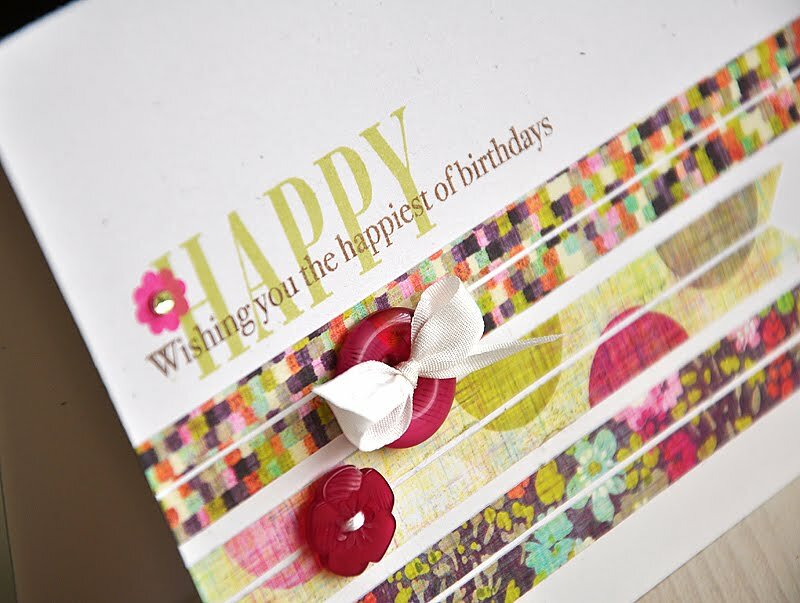 Cut down the center of each and attached to a Rustic White card base at staggering lengths. Next, I pulled out my Celebration stamp set and stamped the sentiment in Spring Moss and Dark Chocolate. Finished the card off with a stamped flower (from the Hanging Out stamp set), a rhinestone, Raspberry Fizz buttons and a tiny ribbon bow. In case your wondering... you can find me on Pinterest here. Hope you enjoy! So fabulous!!! I love this mug inspiration photo!! Can't wait to see all the sets you've designed for this upcoming year! You are amazing!! Your card is stunning! 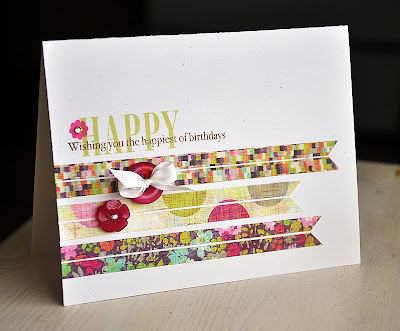 I love the patterned paper choices and it looks so cool split down the center. I love how you layered the sentiment too. This is fabulous Maile! Love the design with the banners and the pretty colors! Love this design! It seems simple when you first look at it, but has so many little details that make it JUST AMAZING. Thanks so much for sharing. Gorgeous card love the design and colors! Maile, this is a beautiful card! I have this paper and am going to have to make some myself! Great job as always. This is so pretty, Maile! Love the way you split those banners, that looks gorgeous! Fabulous inspiration photo! !